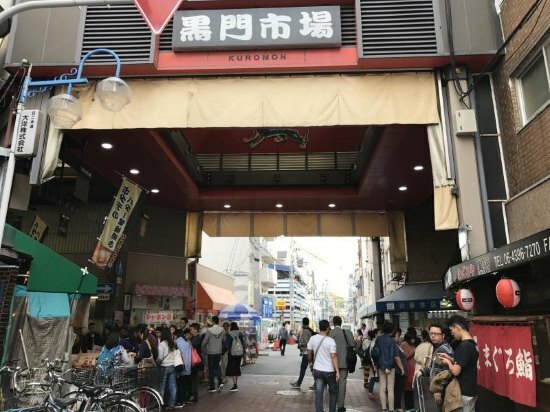 It’s located at the of Kuromon Market and it’s a corner sushi stall. You can easily find the stall. Once you reach the stall, you will saw a giant fish head in front of the stall. After seeing a giant tuna head, and the table filled with the tuna overflowing on little-arranged trays of sushi. Believe me, you should have a try it won’t be too expensive, it really worth the sashimi is like melting once you put into your mouth and it is really juice and fresh. The scallop in there are all fresh and big. It was seasoned with butter, and some soy sauce and it sizzled in its own scallop juices and butter for just a minute until cooked. The scallop was unbelievably delicious. The scallop meat was firm yet soft and silky, and it had natural sweetness, and extremely juicy. You must have a try on this big scallop and it’s not that expensive. If you visiting there at night you will have the discount for the sashimi. There will be a rest station at the end of Kuromon Market, you can rest and enjoy your delicious food there. There will be a money changer inside the rest station, you can exchange some Japanese Yen from there There will be a lucky draw if you buy up to an amount.There will be different prizes in the lucky draw, but you can only use the lucky draw coupon in Kuromon Market. Goodluck to those who going to Kuromon Market with the lucky draw and have a nice trip. Hope there will be some help for you guys after visiting. The Shinminato Kittokito Ichiba Fish Market, also called the Shinminato Fresh Fish Centre, located in the Shinminato Fisherman’s Wharf offers fresh seafood. Onna no Eki Nakayukui Ichiba is a market that sells fresh produce and other Okinawan goods.